Keep cast iron skillets from rusting or scratching when not in use by placing some coffee filters inside them when you put them away in your cabinets. 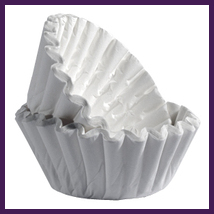 Coffee filters are also the perfect solution for keeping your good China from scratching or chipping while being stored. Simply place a filter between each plate or dish to keep dishes from rubbing together. Coffee filters are a great way to keep precious Christmas ornaments from scratching or breaking. Simply wrap each delicate ornament in a filter before storing after the holiday season. Coffee filters are perfect for absorbing excess cooking grease when frying foods. Simply place a few filters on a dish, then place your fried chicken, bacon, French fries, or whatever you are frying on top. You can even place a few more filters on top of the food for extra absorbency. Save yourself from washing extra bowls by using coffee filters as food holders while cooking. Perfect for chopped vegetables or to hold dry ingredients you will need while baking. Absorb nasty odors in drawers, closets or shoes by placing some baking soda in a coffee filter and wrap with a rubber band. Baking soda is a great natural deodorizer. Run out of dryer sheets? Coffee Filters work well in an emergency. Simply add a few drops of liquid fabric softener to a clean filter – rub the ends together and place in your dryer when drying clothes. It will help prevent static cling as well as add an awesome scent to your laundry. Coffee filters are the perfect size and material when it comes to eating hand foods that are greasy or that have food falling out such as tacos, hot dogs or pitas. Simply wrap the end of the food with a filter before eating to keep hands clean. Coffee filters work really well as emergency blotters for excess oil on skin. Simply leave a few in your purse for emergency makeup touch ups. They can also work in a pinch to remove perspiration while working out at a gym or while out on a hot day. Coffee Filters are great for keeping dirt and soil from leaking out of the draining holes of a flower pot when you water your plants. Simply line the pots with a coffee filter before putting in the plant. If the plant is already in the pot, you can protect it from the outside by cutting a filter to match the size of the bottom of the flower pot and placing it underneath when watering . Coffee filters work awesome as snack bowls when it comes to eating snacks or hand foods such as potato chips, popcorn, peanuts, pretzels or candy. When done, simply throw away. One of the most popular uses for coffee filters (other than making coffee of course) is as a glass cleaner. Works well for cleaning glass table tops, mirrors and even television screens because they are lint free. Strangely enough, coffee filters make excellent covers when microwaving food. Simply cover your dishes or bowls with a coffee filter when heating food to prevent splatter and messes. Run out of paper towels and have a spill that needs to be cleaned from furniture or floors? No problem! Coffee filters are great for absorbing these spills and will not leave any lint behind. Run out of cotton balls? No problem. Pour some nail polish remover on a coffee filter and polish will come right off. Especially handy when you have little ones who eat their popsicles slowly, coffee filters work great for keeping little fingers clean. Simply pop the stick of the popsicle through the filter and presto – no more drips. Keep book pages safe when pressing flowers, by placing the flower in between two coffee filters. Coffee Filters work great for straining cooking oil that you would like to use again. Simply strain the oil through a sieve that you have lined with a new coffee filter. Coffee filters work great to stop the bleeding from nicks and cuts that occur during shaving. Coffee filters make it easy to apply shoe polish. When done, simply toss away! Coffee Filters work great as spoon rests to help keep your kitchen counter clean. Especially useful when you making two or more dishes that will need different rests. Coffee Filters work great for weighing food on food scales. Simply place the food in a filter before placing it on your kitchen scale. Broke the cork into your bottle of wine? No problem! Simply drain the wine through a clean coffee filter and no more cork.